I struck gold this week when I found five cards in my folder that I hadn't blogged! Woohooo! I've been working like crazy on stuff for future dates, but have been scrambling every day on when to blog next. This fun card is one I submitted for publication, but it didn't make it into the issue. 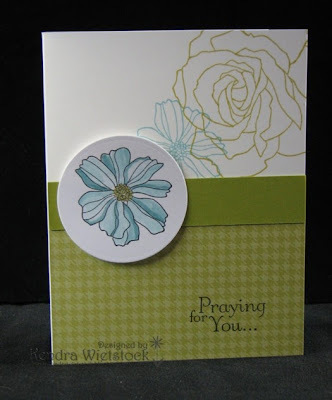 I used the sentiment from an old Stampin' Up! 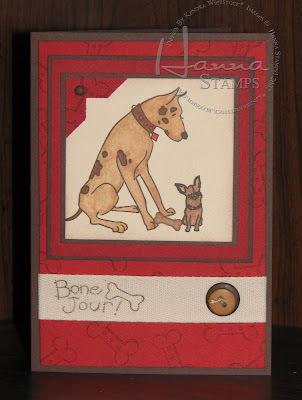 dog set & the rest of the images are from Hanna Stamps! So that's why I picked this card today ~ because I wish I had more hands! This cute set from Our Craft Lounge is called Oceans of Fun & the images are so great for building scenes (which is something I am usually NOT good at). Supplies Used: Stamps ~ Our Craft Lounge (Oceans of Fun); Ink ~ Palette, Copics; Cardstock ~ SU, PTI; Embossing Folder ~ Cuttlebug; Ribbon ~ May Arts; Punches ~ SU & Martha Stewart; Gem ~ Me & My Big Ideas. Happy Inchie Friday! I'm back with another installment of my Inchie Calendar. My June page went together so quick, that I decided to do one for July as well. In fact, I have everything lined up to do August thru December. For June's page, I used on of my favorite stamping techniques on my little white Inchie square. I stamped it with black pigment ink and heat embossed it clear powder. When coloring with Copic markers, these tiny, detailed images tend to run a bit. However, when you heat emboss them, it isn't a problem (or not as much of one). This family picture was taken in Bar Harbor, Maine last summer ~ we loved it there. For my July page, I actually recycled one of my past Inchie rejects ~ lol! I've had this star image stamped and colored since December & never knew what I was going to do with it. 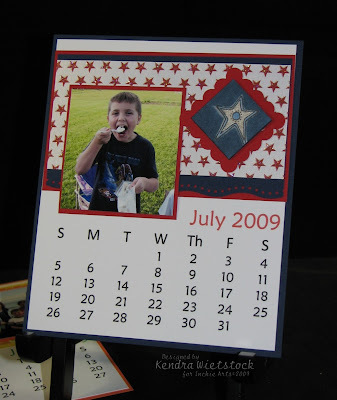 LIGHT BULB MOMENT ~ 4th of July Calendar page. PERFECT! Supplies Used: Inchie Squares ~ Inchie Arts; Cardstock ~ PTI, SU; Pattern Paper ~ K & Co (June), Unknown (July); Stamps ~ Lockhart Stamp Co; Ink ~ SU, Palette, Copics; Edge Punch ~ EK Success; Scallop punch ~ SU. Woohoo...today is Joy's Birthday!! Happy, Happy Day!! To celebrate this great day, a new set from Our Craft Lounge called Kona, is being released on Friday exclusivly at Eclectic Paperie. It's Joy's favorite set, so a bunch of friends (and boy does Joy have A LOT of friends) decided to make some cards for her using this fun new set in honor of her special day. There is a list of some of the girls over on Cami's blog ~ HERE. You can also take a look over on Splitcoast Stampers to see a bunch of samples today ~ they should be popping up throughout the day. 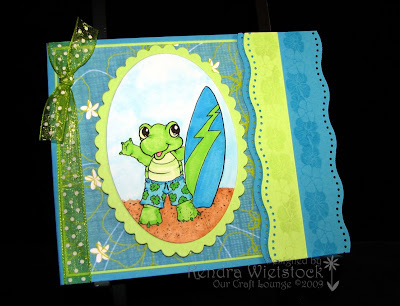 Supplies: Stamps ~ Our Craft Lounge (Kona available only at Eclectic Paperie) & Life's A Beach; Cardstock ~ SU; Pattern Paper ~ Sandy Lion; Ribbon ~ May Arts; Ink ~ Palette, Copics; Punch ~ EK Success; Nestabilities. My fun project for todayare some postcard notes. I used the great new sentiment set from Lizzie Anne Designs called Everyday Sayings & one of my favorite flower sets called Le Jardin. I used a different sentiment on each note card from the Everyday Sayings Stamp Set and they turned out really cute! 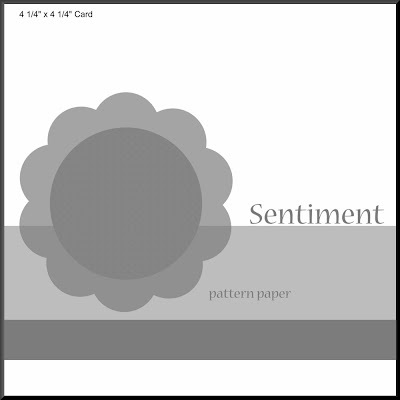 Don't you just love this new paper from My Mind's Eye ~ it's called Pretty Please! I LOVE IT! Earlier today you may have seen a cute little cardbox to put them inside. My sweet friend Val, made a beautiful box & template for one of her classes. Unfortunately, I missed the fact that she hadn't had her class yet & should not have shared the box just yet. I sincerely apologize to Val for my mistake! Once she has had her class in June, she will be sharing her template and I will then post my box again. ETA: I just call them postcards because they are on one panel ~ they fit perfectly inside an envelope. Supplies Used: Stamps ~ Lizzie Anne Designs (Everyday Sentiments, Le Jardin); Cardstock ~ SU; Pattern Paper ~ My Minds Eye; Punches ~ SU; Ink ~ SU, Palette & Copics; Ribbon ~ SU. My sweet friend Pine always uses Kraft cardstock with and white ink & is UBER talented. This card was both inspired by and is dedicated to her today. 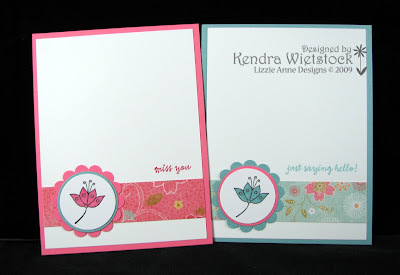 I just ADORE this fun set and Digital Paper pack ~ both called Garden Inspirations by Lizzie Anne Designs. There are tons of gorgeous samples in the Sketchbook over on the website ~ run over and take a look. This day is all about remembering heroes, going to parades & having picnics. Hope everyone has a wonderful holiday! 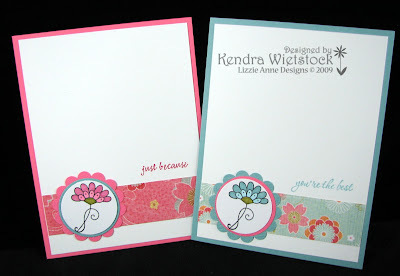 This week, it's my turn to host the Lizzie Anne Designs sketch challenge. Here is my sketch ~ come play along! And here is my sample to go along with it. It's even got the watermelon for today's picnic! I used the sets Chillin' & Grillin' (which is 20% off this week) and Everyday Sayings. Supplies Used: Stamps ~ Lizzie Anne Designs (Chillin' & Grillin' and Everyday Sayings); Cardstock ~ PTI; Pattern Paper ~ KI Memories; Ink ~ Palette, Copics; Punches ~ SU; Ribbon ~ May Arts. I hope everyone is having a super holiday weekend. I've been working non-stop on some fun new endeavors, but decided to stop and play with my new Kit of the Month from Unity Stamps. 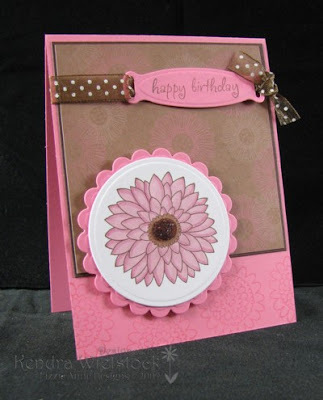 Each time I get a new kit, I pick out the stamp that first catches my eye ~ this month it was this gorgeous flower stamp. 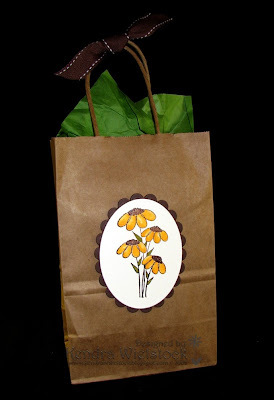 This gift bag took just a few minutes to finish & now I'm all ready to put something fun inside. 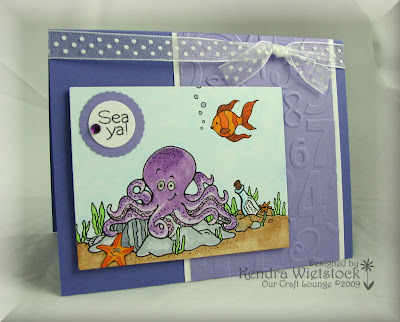 Supplies Used: Stamps ~ Unity Stamp Co (May KOTM); Cardstock ~ PTI, SU; Ink ~ SU, Copics; Nestabilties; Ribbon ~ SU. Happy Saturday! Woohoo...it's the weekend. I was looking through some files on my computer and realized that I never put this card on my blog! 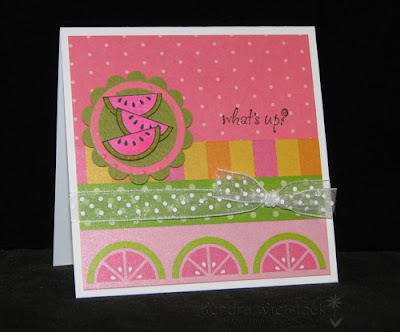 This cute little card was actually on the cover of Scrap & Stamp Arts last August & I was SUPER excited about that! Hope it's gorgeous where you are this weekend and you have lots of fun things planned! ETA: I used Copic markers to color the image. Supplies Used: Stamps ~ Hanna Stamps (Dog sets); Cardstock ~ SU; Pattern Paper ~ DCWV; Ink ~ Palette & Copics; Nesties; Ribbon ~ May Arts. Inchie Friday ~ Movie Time! Isn't this image fun? 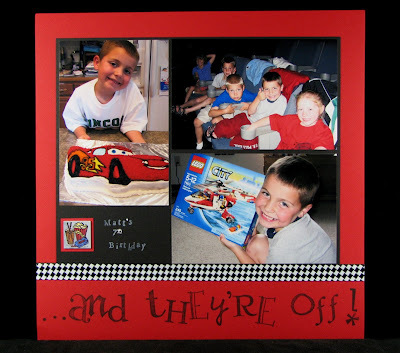 When I saw it I knew I wanted to use it for a layout of Matt's 7th birthday. We took a few of his friends to the movies to see Cars. Fun times! And sometimes I wish he was 7 again ~ in just a few weeks, he will turn 10 years old. WOW! 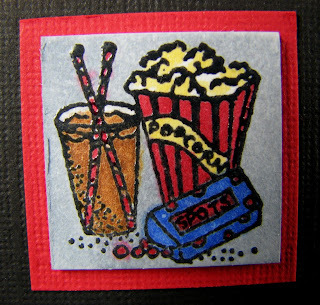 I stamped the image on the white Inchie square with pigment ink and heat embossed it with clear embossing powder. I find that with these very detailed small images, it's much easier to color them when they are embossed. It's just a super simple layout, but it gets the job done (and it's one more off my list to do)! 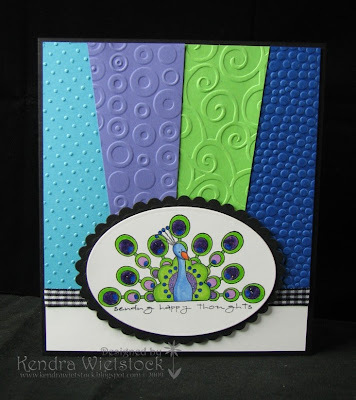 I also used this page over on the Wacky Wednesday challenge on Rubbernecker! 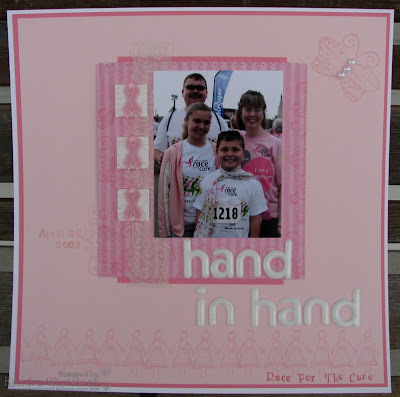 Supplies Used: White Inchie Squares ~ Inchie Arts; Stamps ~ Hero Arts, Stampin' Up! 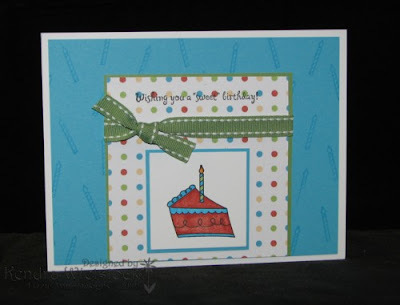 & Lockhart Stamp Co; Cardstock ~ Doodlebug; Ribbon ~ Michaels; Ink ~ Palette, Copics & SU. I haven't really had tons of time to do any sketch challenges in a few weeks so I thought I'd give this one a try from Lizzie Anne. I finished my entire card and then didn't really like the placement of the cake image, so I cheated a little and moved it to the center. 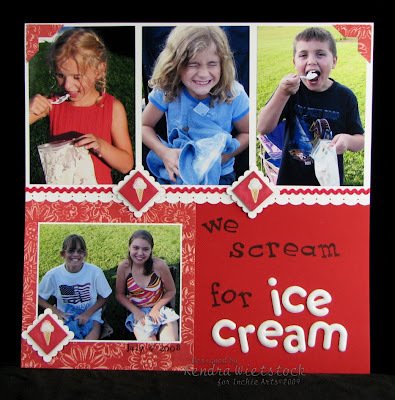 I used the fun little set Sweets and Treats along with the matching Digital Paper Pack. Have your tried them yet? Oh my ~ they are super fun! Supplies Used: Stamps ~ Lizzie Anne Designs (Sweets and Treats); Cardstock ~ SU & PTI; Pattern Paper ~ Lizzie Anne Designs (Sweets & Treats Digital Paper); Ink ~ Versamark, Palette, Copics; Ribbon ~ SU. The kids will be getting out of school very soon now & the graduates will be having parties left and right. So here are two cute sets from Our Craft Lounge just perfect for these important occasions ~ Bookworm & Back to School. Sorry for the short post today, but I'm working hard on lots of new stuff. Have a great day! A few weeks ago I shared the first two cards we made at our last Stamp Club night. Last night I realized that I forgot to show you the other two cards we made. There were fairly easy cards to put together, but the girls loved them. 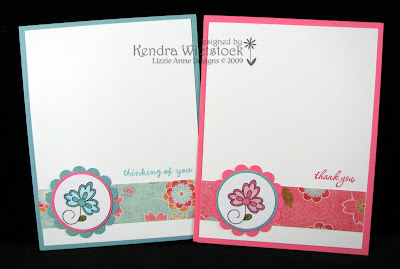 The first card was a CASE from the catalog ~ I just LOVE that new Fifth Avenue Floral set! I'm back! Sunday morning I actually woke up and was disappointed that I didn't have a new project to show you & promptly wrote this one out. But, boy oh boy do I have a project for you today! I am sooooooooo excited about it! 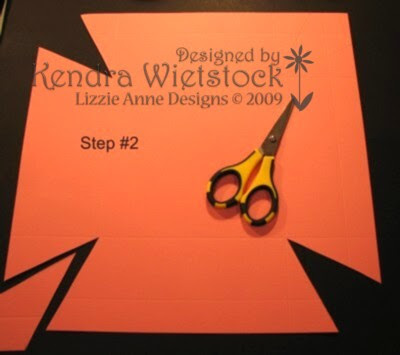 Step 1: Select a 12”x12” piece of textured cardstock. From each edge, score at 1” & 3” (8 score lines total). 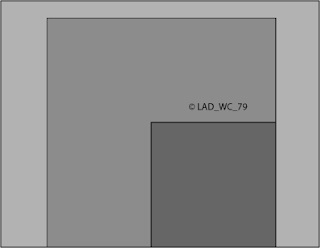 Step 2: Once your cardstock is scored, measure 1 ½” from each corner & draw a pencil line diagonally to the 3” score mark. Cut along both lines and remove the triangle piece. 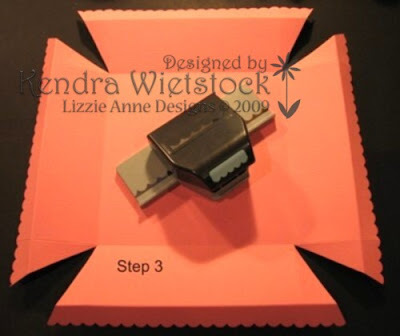 Step 3: Use a scalloped edge punch on the outside edges of the box. 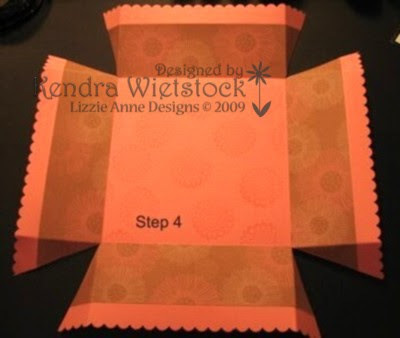 Step 4: Stamp the inside of the box with a flower image and line both the inside and outside of the box with coordinating pattern paper. 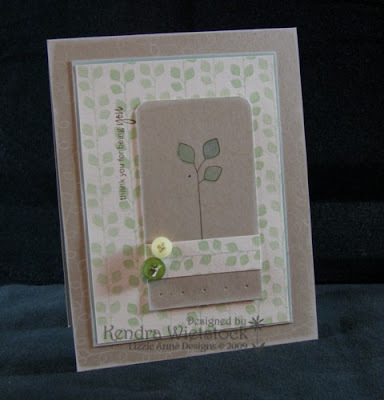 (Garden Inspirations stamp set and Digital Paper Pack used here). 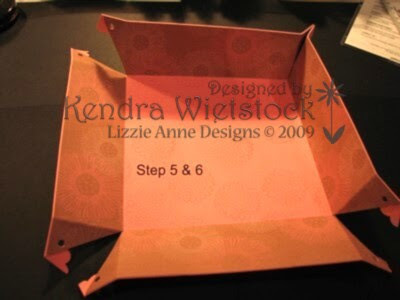 Step 5: Fold and glue scalloped edge to the outside of the box & fold score marks to make the box. Step 6: Punch holes on the outside tabs of the box & attach ribbon to tie them closed. Supplies Used: Stamps & Digital Paper Pack ~ Lizzie Anne Designs (Garden Inspirations); Textured cardstock (heavy weight) ~ SU; Ribbon ~ SU; Scallop Edge Punch ~ EK Success; Ink ~ Versamark. Are you still hopping? The big Unity Kit of the Month Blog Hop is still going on, but I was getting a bit antsy with not posting a new project all weekend, so here is another one. You may be joining me from Christi's fabulous blog ~ if not, and you want to start at the beginning, you can start your blog hop at the Unity Blog from Friday's post. I made this project using the April Kit of the Month. 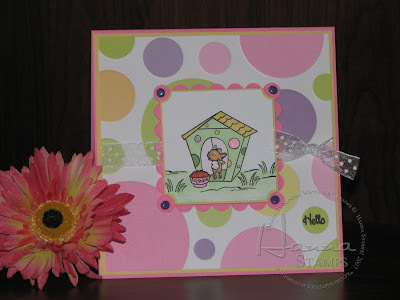 Your next stop on the Weekend Blog Hop is the amazingly talented.... STEPHANIE. If for some reason you get lost along the hop ~ see this thread on SCS for a list of bloggers. Are you hopping today???? Today is the start of the big Unity Kit of the Month Blog Hop. Just wait until you see all the great projects on the hop this weekend! 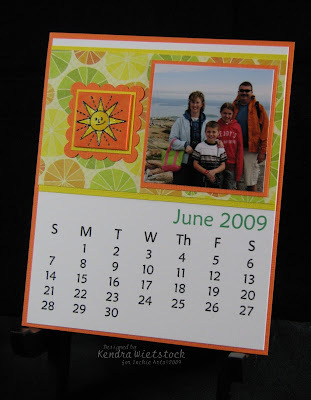 Are you joining me from Christi's fabulous blog? If not, you can start your blog hop at the Unity Blog to go back see all the fun projects before mine. For my first project, I used the adorable peacock from the January Kit of the Month & my all-time favorite sentiment from the March Kit of the Month. 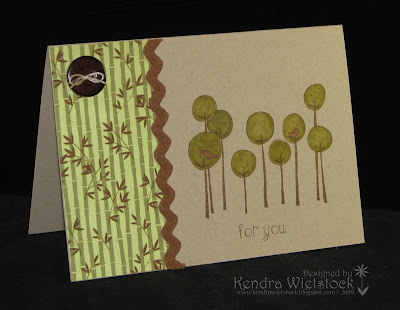 On my second project today, I used this fun little grove of trees from the April Kit of the Month. 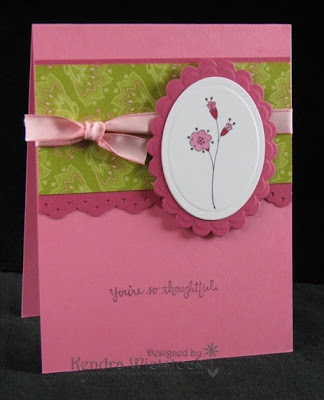 Your next stop on the Weekend Blog Hop is the amazingly talented.... STEPHANIE. If for some reason you get lost along the hop ~ see this thread on SCS for a list of bloggers. To my regular visitors ~ I am taking a rare weekend off & will have a new project up on Monday! Happy early Friday ~ lol! I know I'm rushing the weekend, but I have something else I need to post tomorrow and I really wanted to share my Inchie Arts project this week. My page this week includes some fun pictures I took last year on the 4th of July. We had a small neighborhood party and the kids (and a few adults) made homemade ice cream in ziplock bags. They had a blast and it was YUMMY! 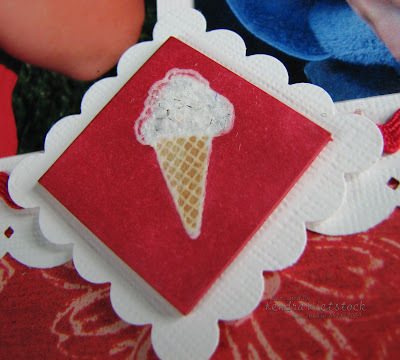 For my little white Inchie squares this time, I embossed the image in white pigment ink and then colored the background and the cone with Copic markers. Then I added some glue on the ice cream portion of the image and sprinkled on White Sparkly Fluff. 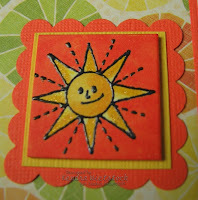 I love the little punch of fun these embellishments add to the page. Supplies Used: White Inchie Squares ~ Inchie Arts; Cardstock ~ Doodlebug & SU; Pattern Paper ~ Adorn It; Ink ~ SU, Copics; Stamps ~ Lockhart Stamp Co & SU (alpha); Punches ~ SU & EK Success; Sparkly Fluff ~ OCL; Sticker Letters ~ American Crafts; Ric Rac ~ May Arts. Hop Away ~ One More Day! It's Friday ~ HAPPY BLOG HOPPING TIME!